Herewith the last of the posts inspired by my recent excursion to the Halls of Academe (that's my daughter's college, folks). After many years away from a classroom of any sort, I found myself sitting in on a graduate class on Aztec Manuscripts (which my daughter was taking), described in the catalog as focusing on "Sahaguntine illustrated manuscripts of the sixteenth century. Painted by Aztec artists, they record extensive narrative evidence of Aztec life and beliefs, prepared under the direction of Fray Bernardino de Sahagun. ... In this class, we will contextualize the Sahaguntine manuscripts, exploring the preconquest Aztec tradition of pictorial codices and the visual and narrative impact of European books; complex relationships between image, text, and oral tradition; emergence of syncretic form and iconography; and contested epistemologies shaped by the Spanish Conquest." Whoa. Okay, I've got plenty of degrees, and even I have to reach for a dictionary for a few of those terms. Never mind–just sit back and enjoy the lecture. I should point out that the professor holds a Ph.D. in art history from Columbia University, and has written books and articles not only on Latin American art but also on graphic novels and comic art. And, believe it or not, when you see images of the Aztec documents, you get the connection between Aztec art and modern comic art. As an example, I include one scene from the what is known as the Codex Borbonicus, which is in fact a single sheet of "paper" folded like an accordian. It's over 46 feet long. 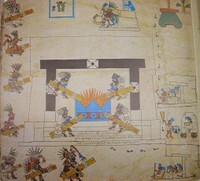 The third section focuses on rituals and ceremonies, and the image here depicts the end/beginning of the 52-year cycle, when the "new fire" is lit. Okay, okay, enough education. Take a look at the picture. This image shows the lighting of the new fire, in the middle there. But that's not what caught my eye. What intrigued me was a minor but consistent component of the Aztecs' approach to visual story-telling: foot prints. If you look very closely, you can see that to indicate the sequence of events in the picture, there's a little trail of footprints leading, in one direction only, from one part to the next. What a handy device. You have this nice blank page, and a lot of information to fit onto it, and what is pleasing to your eye in terms of distribution of images on the page may not work with the chronological sequence. Therefore you need some way to direct the reader/viewer so that the story makes sense. In our contemporary culture, you might put arrows; the Aztecs used footprints. Walk this way, reader. And somewhere lurking in there is an analogy to mystery-writing. Mystery writers create a path for the reader to follow. It may not be immediately evident, but there is an order to it–footprints, if you can see them. By the way, the New Fire ceremony marked the transition from one 52-year cycle to the next. It was preceded by abstinence from work and eating, the destruction of old household items, and the observation of silence, because this was a dangerous and critical time. Then all the fires in the realm were put out. When the constellation Orion rose over the horizon, a man was sacrificed on the summit of an extinct volcano and a fire was started on his chest (yes, really). Then the New Calendar Round was declared, and that fire in the man's chest was used to light torches which runners carried through the city to light the temple hearths and household fires.